1. Enter the information for one exposure sheet. 2. Copy it to the other scene. 3. Modify the second exposure sheet as needed. The Copy command lets you copy an existing exposure sheet from one scene into another scene. You can then modify the copied exposure sheet using Stage. 1. Select the environment and the job from the Control Center window. 2. In the top menu, select Scene > Copy You can also right-click anywhere in the Scenes list and select Copy. 3. Select the environment, job, and scene to copy from the exposure sheet from the From panel. 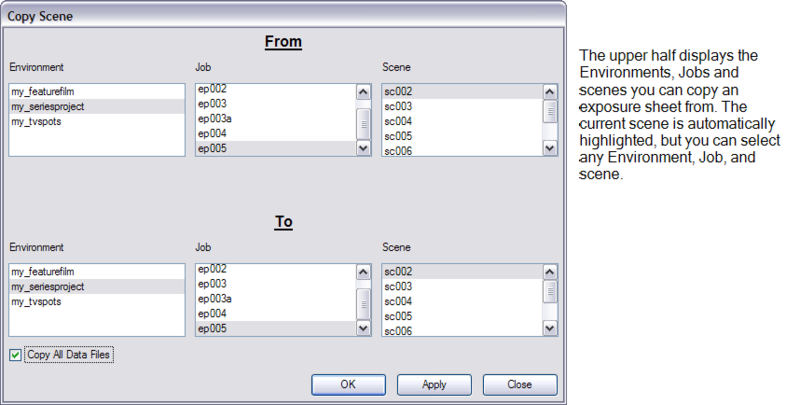 The lower half of the dialog box displays the Environments, Jobs, and scenes to which you can copy the exposure sheet. 4. Select the Environment, Job, and scene where you want to copy the selected exposure sheet to the To panel. 5. If you want to copy the associated animation data files with the scene's exposure sheet, select the Copy All Data Files option. Harmony will place a copy of the animation data in the target scene's storage directory. 6. Click OK or Apply to complete the copy or click Close to abort the copy command. 7. If the scene you are copying to already has an exposure sheet, a Confirm dialog box appears to make sure you want to replace the existing exposure sheet. ‣ Click Yes if you want to copy over the existing exposure sheet. ‣ Click No to cancel the copy or to select a different scene. The Copy Xsheet dialog box disappears. You can view and modify the copied exposure sheet using Harmony Stage.